An exquisite pearl side tiara which takes its influence from pearl 'pieces' from the '20's and '40's. 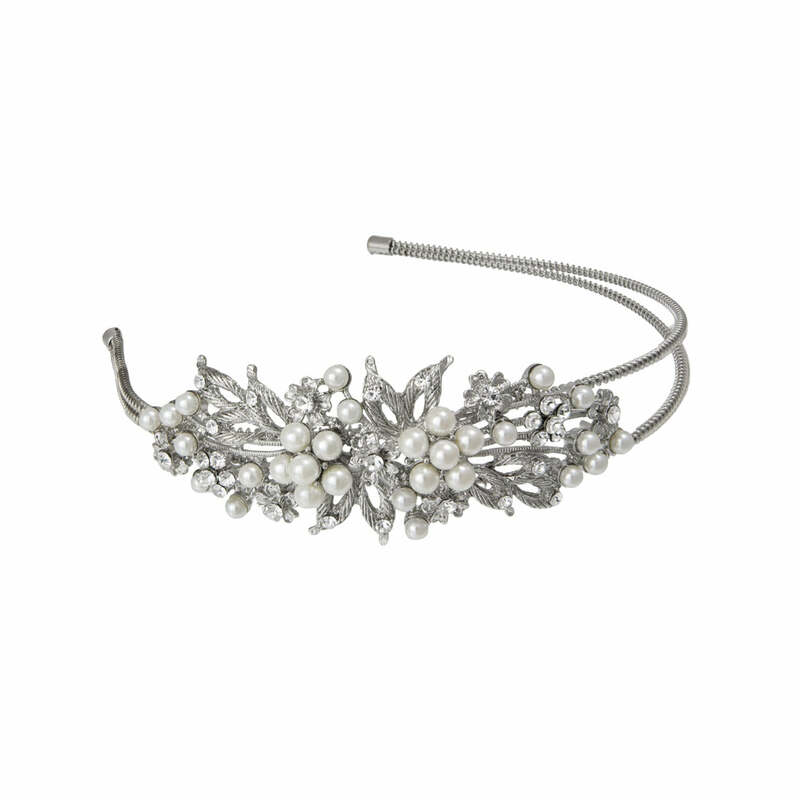 This vintage pearl side tiara flaunts its beauty to perfection. Exquisitely blending influences from precious vintage hair accessories from the roaring Twenties with a subtle touch of the glamour of 1940's Hollywood, the design features a double silver tone band embellished with a divine floral design of Austrian crystal studded open leaves and pale ivory pearl flowers. A classic headpiece for evening occasions or to wear to the races or a wedding instead of a hat, it really needs little accessorising except perhaps for a chic pair of pearl and crystal antique style earrings. A timeless side tiara for brides wearing vintage style wedding gowns, this would also look amazing as a wedding head band for bridesmaids. I bought this last week for my wedding in September. It arrived really quickly and is really pretty. Definitely worth the money, better quality then some I have seen. I have to say...I loved wearing this. It was comfortable and went perfectly with everything. I don't think I could ever bring myself to part with it, so I think I will just have to keep it forever! I bought this beautiful tiara for my wedding last month. I felt amazing on and it matched perfectly with my pearl jewellery set and dress. The delivery was super quick and I found the price very reasonable for what I got. The pictures really don't do the tiara justice! I ordered this tiara for my wedding in September and it's absolutely gorgeous - I can't wait to wear it! It looks much more expensive than it is but isn't over the top.